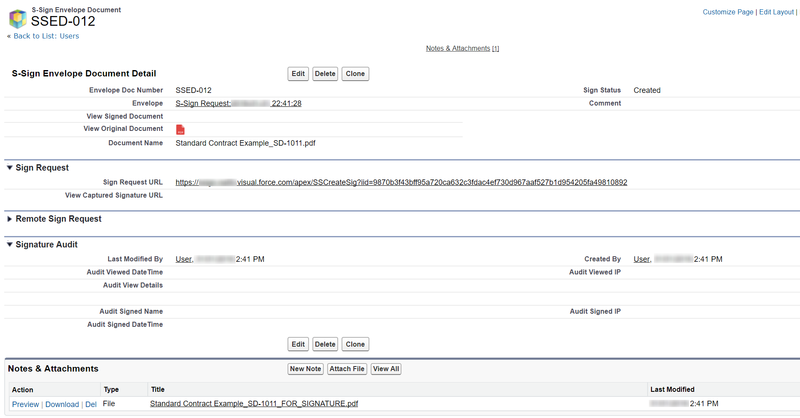 Sending an E-Signature request with S-Sign is as simple as generating a document and sending an email. 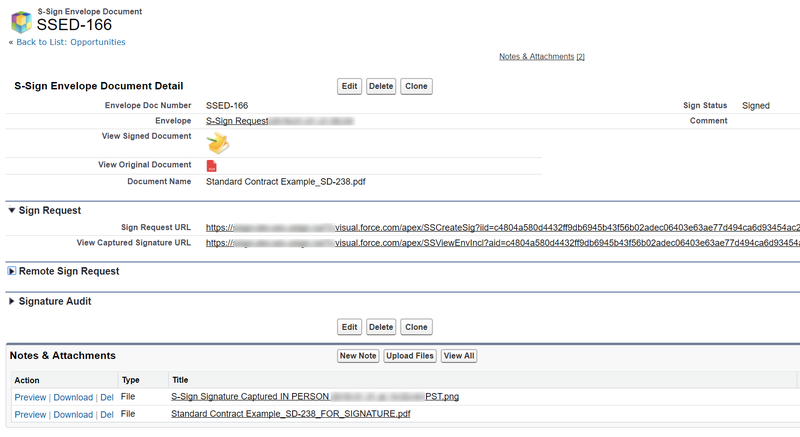 Once you have created an HTML E-Signature request template and a signable PDF template, navigate to a Salesforce record on and click the S-Docs button. 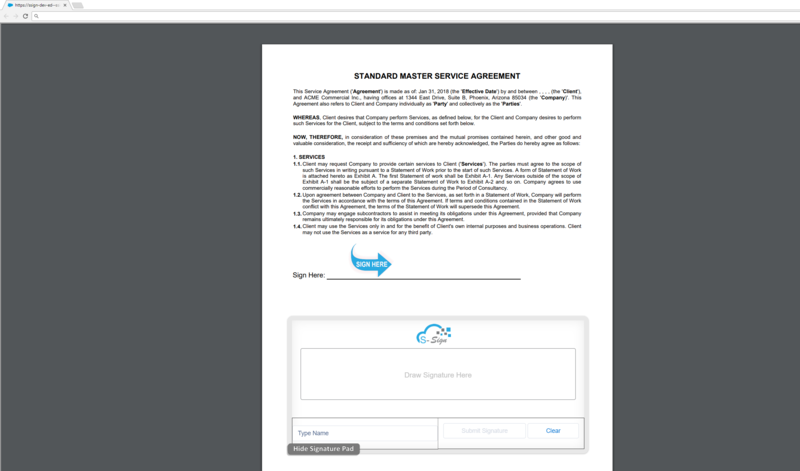 Next, select your HTML E-Signature request template and your signable PDF template. Click “Next Step” to generate documents with these templates. S-Docs will then recognize that you have generated an E-Signature document and offer a “Send Documents for Electronic Signature” button. Click this button to email the E-Signature document. On the email page, you have the option to edit the usual email fields (To, CC, BCC, Subject), attach additional files, and edit the body of the outbound email. Note that the PDF we generated is not included on this email as an attachment; this is because the email contains a link to an interactive webpage where the user can view and sign that PDF. Click “Send” to send the document for E-Signature. The recipient can then drag the “Show Signature Pad” button somewhere else if it’s in the way of something they’d like to read. When the recipient is ready to sign, they can click the “Show Signature Pad” button to open the signature pad. The recipient can then type their name, draw a signature, and submit their information. Once the recipient clicks “Submit Signature”, their signature is merged into the document, and both you and the recipient receive a confirmation email containing the signed document. After submitting their signature, the recipient is immediately redirected to view signed version of the document. The signed version of the document includes the signer’s name, their signature image, and the date and time at which they signed the document. NOTE: You can send multiple documents in a single e-signature request. To send multiple documents, go to your Site settings and add the VF page SSMultiSign to the list of VF pages for the site: Setup > Build > Develop > Sites > [Your S-Sign Site] > Site Visualforce Pages​ > Edit and add the page SSMultiSign to your site's Visualforce Pages to enable this feature. Upon receiving the email, the recipient will be directed to an intermediate page that lists all of the documents to be signed. What happened in Salesforce while all of this was going on? Let’s take a step back in time to way before our recipient has signed the document. Immediately after you clicked “Send Documents for Electronic Signature”, an S-Sign Envelope record was created. Let’s view this S-Sign Envelope record. We see that the record has a related list of S-Sign Envelope Document records. We see that an S-Sign Envelope Document record was created for each signable PDF that was included in our E-Signature request. We see that it has a sign status of “Created”, meaning it hasn’t been signed yet. Additionally, we see that the S-Sign Envelope itself has a status of “Created”, meaning none of its S-Sign Envelope Documents have been signed yet. Note. 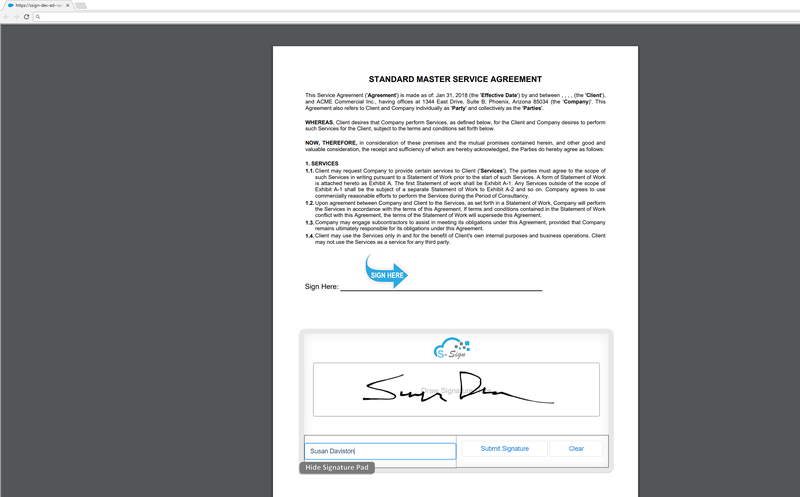 Currently, S-Sign only supports one signable PDF per E-Signature request. Now let’s view the S-Sign Envelope Document. 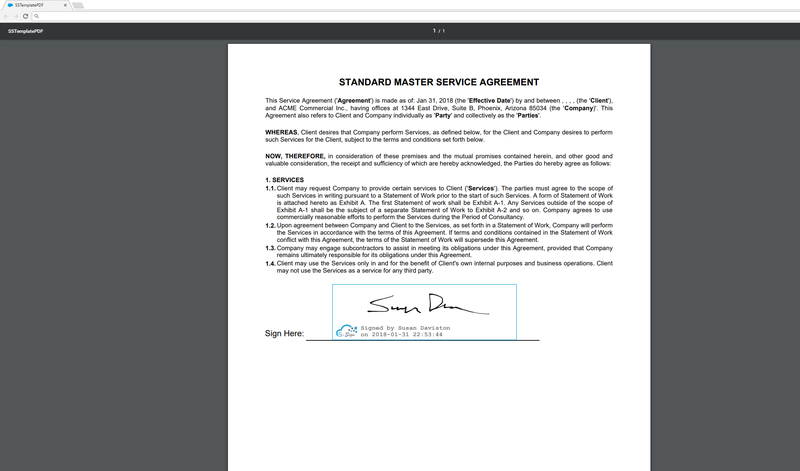 Since the document contained by this S-Sign Envelope Document hasn’t been signed yet, we only see links for the signature request and for viewing the original document. Additionally, the Notes & Attachments related list only contains the original document. Now let’s take a step forward in time to when our recipient has signed the document and clicked “Submit Signature”. 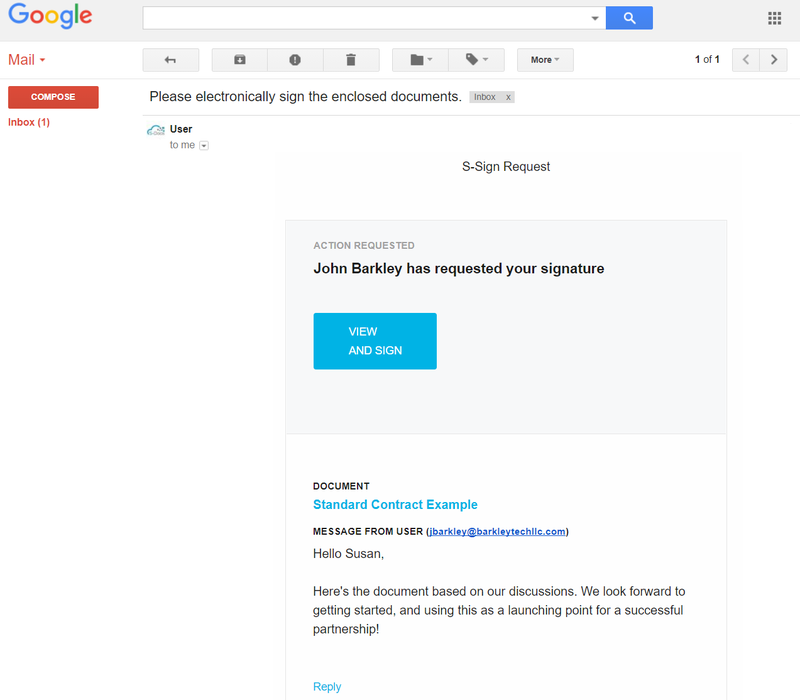 At this point, the S-Sign Envelope Document’s status has been updated to “Signed”, the “View Signed Document” link appears, and a the picture of the recipient’s signature has been added to the Notes & Attachments related list. 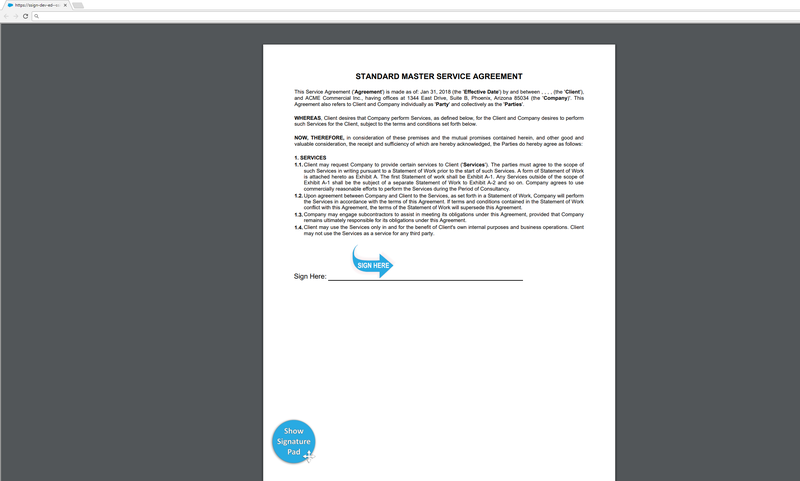 Then, looking at the S-Sign Envelope that contains this S-Sign Envelope Document, we see that the status has been updated to “Completed”, meaning all S-Sign Envelope Document records in this S-Sign Envelope have been signed.